Michael Dunlop missed the official British Superbike test at Silverstone as his new 2019 Tyco BMW machine was not ready in time. The 18-time Isle of Man TT winner and fellow Mountain Course star Peter Hickman (Smiths Racing BMW) also sat out the BSB tests at Monteblanco in Spain and Portimao in Portugal in March as their respective teams took late delivery of the 2019 model. However, Dunlop was in action at Bishopscourt in County Down on Wednesday with the rest of the Moneymore-based team as he made the most of the dry conditions. A statement issued by the team on Twitter on Tuesday said the bikes were not ready in time for the Silverstone BSB test. Accompanying pictures of the new Tyco BMW, the official Twitter update said: ‘[We] won’t be on track as we are busy in the workshop with preparations to these beauties for further testing this week ahead of round one at Silverstone’. 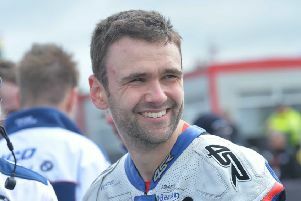 Dunlop was left on the back foot last year due to a lack of track time before the start of the international road racing season, with the 30-year-old agreeing a late deal to ride for Philip and Hector Neill’s team. Senior TT winner and 135mph man Hickman was left in a similar situation with his own 2019 S1000RR, but Bradford's Dean Harrison has been making hay while the sun shines. Harrison was so close to a breakthrough victory in the blue riband class at the TT last year on the Silicone Engineering Racing Kawasaki and should be ready to hit the ground running. On the BSB front, new Honda Racing signing Andrew Irwin was sixth fastest on the combined time sheets at Silverstone, 0.399s behind McAMS Yamaha rider Jason O’Halloran. Ballinamallard’s Josh Elliott was seventh fastest on the OMG Suzuki, while Glenn Irwin was 12th (Quattro Plant JG Speedfit Kawasaki), six tenths off the top spot. Aussie Josh Brookes was third on the PBM Ducati V4 behind Dan Linfoot (Santander TAG Yamaha). Brookes’ team-mate and ex-MotoGP rider, Scott Redding, was 10th. Eglinton’s David Allingham was 23rd on the EHA Racing Yamaha. Along with Harrison, other road racers in action at the test included James Hillier, Conor Cummins, Lee Johnston, Gary Johnson and Paul Jordan.